Whilst I was in India the tea I drank was almost exclusively masala chai, I did try some ‘English tea’ out there but they use buffalo milk rather than cow’s milk which gives the tea a strange taste, something a good dose of masala gets rid of. So it was masala chai from then on. First of all a rant word about the word chai. It really bugs me when I see someone talking about ‘chai tea’ – what you are essentially saying there is ‘tea tea’ because the word chai means tea. Chai doesn’t refer to the fact that it is spiced tea, but chai means tea. Simple as that. Hence why you call it masala chai because it is tea spiced. This also applies to lentil dahl. Dahl means lentil so lentil dahl is lentil lentil. Glad I got that off my chest. Masala chai is drunk everyday by most Indians, I tend to drink it occasionally maybe once a week. I particularly like it when it is a very cold day or I am feeling a bit under the weather – sweet, spicy hot tea is the best thing for these situations. It takes longer to make than an average cup of tea but it is so worth the time. Normally it is not recommended to boil tea or use boiling water on tea, but here you boil it twice – once with masala and then once after adding milk. This way the spices really get into the tea and the tea brews quite strongly to compete with the spices. You don’t necessarily have to use a really good quality loose tea here either, the contents of a couple of teabags will do! You can buy tea masala in most good Indian grocers, I have found one place online, or you could try making it yourself. It is a mix of cardamom, cinnamon, cloves, black pepper, ground ginger and nutmeg – this recipe is pretty good. 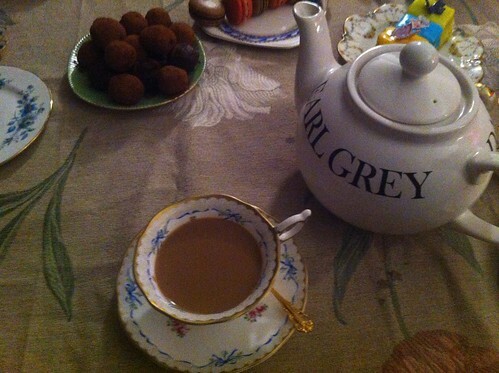 I made this last weekend with the lovely Miss Sue Flay, who was very keen to learn how to make proper masala chai. We served it in a teapot with dainty little tea cups, but masala chai is equally at home in a big mug, or the traditional way – in a tall glass. 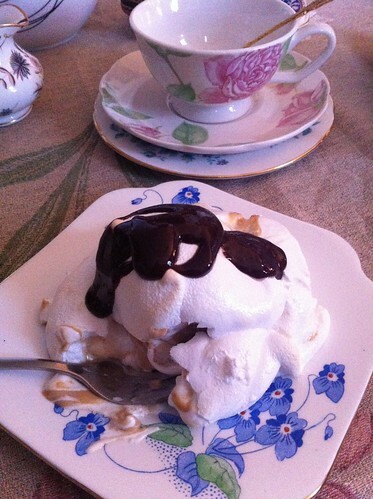 We indulged in a yummy baked mocha alaska and rich chocolate truffles made by Miss Sue Flay. Add the water, tea, sugar and chai masala to the pan. Bring to the boil on a high heat. Once the tea is boiling vigorously, after about 5 minutes, add in your milk. Turn the heat down slightly and wait for it to boil again, be careful at this stage as it can boil over the side of the pan really quickly! When the milk boils to the top (about 2-3 minutes), remove from the heat, strain into your cup – or leave unstrained and serve in a teapot. 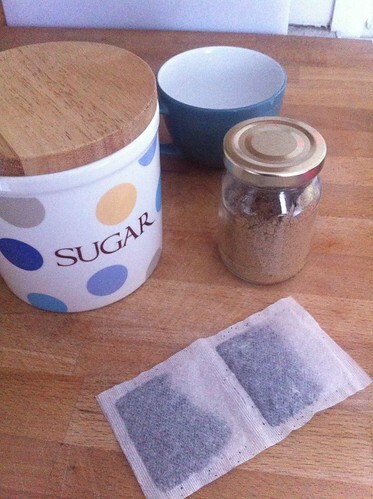 Sometimes you’ll get a skin on your tea as the tea cools, just remove this with a spoon and it is ready to drink.